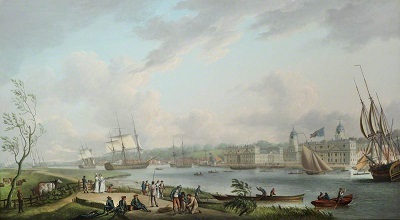 The Isle of Dogs is surrounded by the River Thames on three sides and for generations, Islanders have developed a close link to the river and the ships that travel up and down the river. 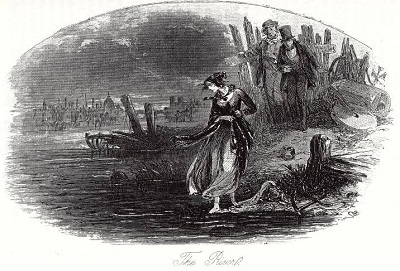 However, although the river is relatively benign, many stories have been told about mysterious and strange happenings on the river and along its banks. Recently I came across a newspaper report from 1916 which discusses many of these old stories of crime and ghostly happenings. Just as no other river has quite the same wonder as belongs to the Thames, so no other river is so wrapt in mystery,, so surrounded with stories of tragedy and crime. Many of the old waterside houses, which rise sheer with the river, contain rooms in which the floor is built directly over the water—floors upon which one could stand in apparently perfect safety while someone in an adjacent room worked a lever which caused the floor to open and their victim to drop into the river. A gambling club is said to have met in such a room once a year to play for tremendous stakes. The party played on, until one of their members was ruined. Then the rest of the men went away in silence, while the ruined man went down into the dark waters. One of the old waterside houses at Wapping, too, is among the bits of the Thames with a reputation for being haunted. A flight of steps leads from the house to the river, but these steps are disused, and the door at the top of them is walled” up. Despite this, often people passing by on the river at night-time swear, to have seen two men come through the walled door and down the steps. Then, after lowering some bundle into the waters, they return to the house. The identity of the men and the contents of their handle remain among the insoluble stories of the Thames. The Thames-Police Force, of about 300 men, is employed to guard against all sorts of additions to the mysteries of the Thames, and their task is of far greater magnitude than might be casually, imagined. Most imperative is it that each member of the force shall he an expert swimmer and understand the right methods for dealing with persons rescued from the water. A very large number of persons are saved from intentional and accidental drowning in the river every year, an average number somewhere between seventy and a hundred. But the number of persons who are found drowned strikes are still greater averages—it is never less, and often more than a hundred in a year; besides which, it is well known that the waters of the river close above many persons of whom nothing more is ever seen or heard. But, if stones could speak, the bridges across the Thames could tell many pitiful and grim life stories, especially Waterloo Bridge, which has such sad associations as to have gained it the sobriquet of “The Bridge of Sighs.” Incidentally, Waterloo Bridge is another part of the Thames which is said to be haunted. It is not so very long since a more than usually clear-sighted man went to the police with the information that he had seen a woman jump from the parapet of Waterloo Bridge. 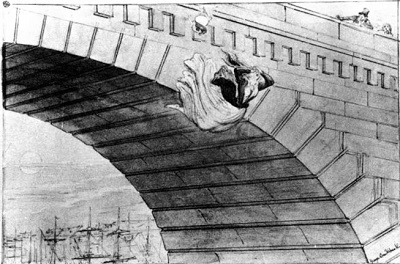 He had been crossing the bridge late one night, when he had noticed a woman in black walking in front of him. Suddenly he saw her make an appealing gesture, but before he could reach the woman she had disappeared. 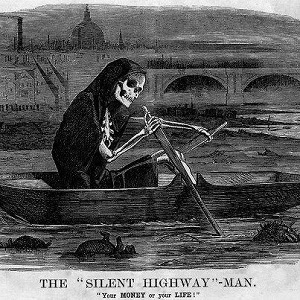 Another mysterious thing about the Thames which no amount of police supervision will destroy, is the “ghost” boats which have been and are, frequently seen in various parts of the river. It is a fact that river police patrols have actually given chase to such ghost ships, to find there is nothing substantial to be found on reaching the place where the ships had seemed to be. One of the most curious stories of this kind is that of the mysterious boat which was seen making its way along the water towards London Bridge one day, about a quarter of a century ago. As she neared the bridge there was a tremendous explosion, a vivid burst of light, and then nothing ! Not so much as a splinter of wood remained of the boat which had been, and the story of it lingers from that day to this as one of the hundreds of tragic unknown things which form the secrets of the river mystery. This newspaper report reminds us that in the Victorian era especially, there were great interest in the paranormal, supernatural and occult. There might be many reasons for this, one being the high mortality rates. Many Victorians admitted to having communication with ghosts and believed without question of their existence. One of the curiosities of the Isle of Dogs is that it is surrounded by iconic views of London from Canary Wharf to the north, the City of London to the west and the O2 arena formerly the Millennium Dome to the east. 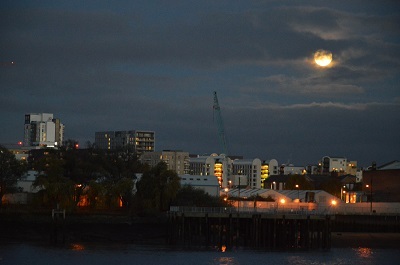 However it is the view from the south over to Greenwich which is considered one of the most famous views in London. 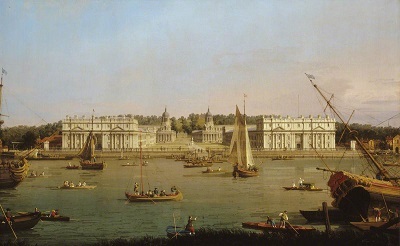 Standing in a spot not far the present Island Gardens, the view was judged to be the greatest view in Europe by Sir Christopher Wren in the 17th Century and it is especially associated with the painting of Greenwich from this spot by Giovanni Antonio Canaletto in the 18th Century. Recently I have come across a number of other paintings that feature the view from the river or the Isle of Dogs which illustrate the importance of this small stretch of water and how the river traffic has changed over time. Canaletto’s painting was painted around 1752 and resembles the artist’s pictures of the Venice Grand Canal especially with use of craft and people in the foreground. Especially interesting is the large ship being repaired on the foreshore. 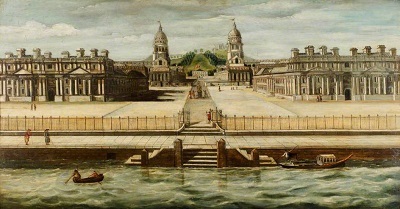 From roughly the same period is Greenwich Hospital by Thomas Lawranson but provides an interesting close up the buildings. Some forty years later, Robert Dodd painted a very different scene, the river is bustling with all different vessels. Perhaps most interesting of all is we see the foreshore at the southern tip of the Isle of Dogs, The riverbank is built up and full of people possibly waiting to use the ferries across the river. The ferrymen in the river are transporting passengers. It is worth remembering at this time, much of the Island was used to fatten up livestock. 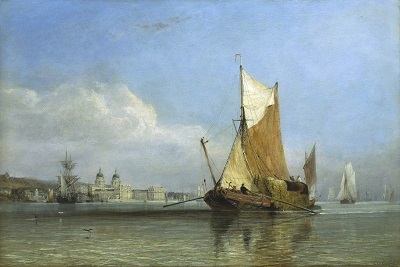 Into the 19th century, Hay Barge off Greenwich by Edward William Cooke provides an attractive picture of a Thames barge carrying a cargo of hay and other goods. These barges were remarkably stable with a shallow draught and carried hay from as far as Suffolk and Margate to feed the thousands of horses in London. Under the hay they often carried a heavier cargo such as bricks. 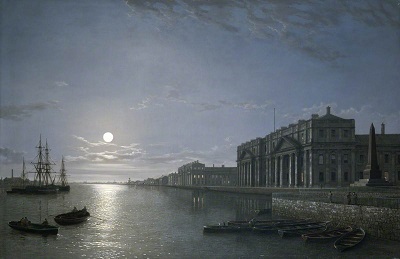 A rather different view of the River Thames and Greenwich Hospital is made by artist Henry Pether who like his father, Abraham ‘Moonlight’ Pether of Chichester specialised in moonlight scenes. Henry Pether views of the Thames were very popular and it is easy to see with this attractive serene scene. 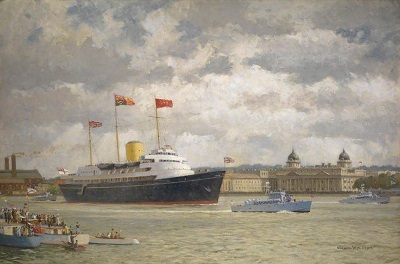 Into the 20th century, the arrival of the Royal Yacht Britannia was the cause for celebration after the Coronation the previous year. This was the first time, the royal yacht had made its way up the Thames and was watched by hundreds of thousands of people all along the riverside. 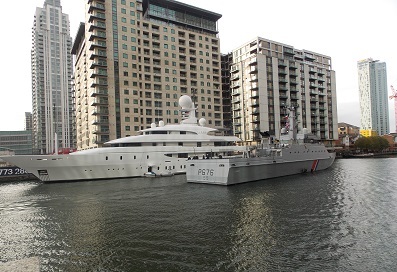 People living on the Island joined the crowds when the yacht made its way around the Isle of Dogs and into London. 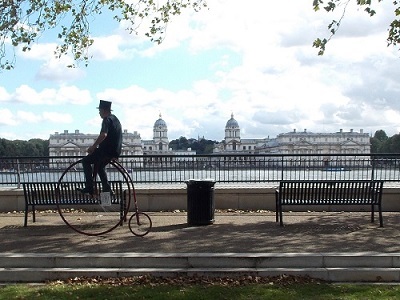 In the rapid development of London in the past 250 years, very few areas have been left untouched. 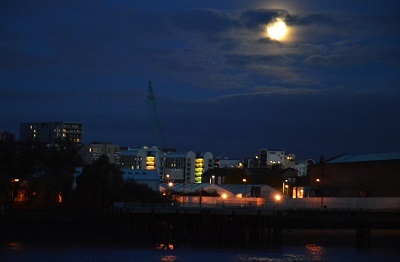 However the view from the Isle of Dogs over to the Naval College has changed little over that period. The greatest change has probably been the vessels that have passed one of London’s great landmarks, gone are the great old warships, clippers, steamships, working barges, lighters and ferries that once dominated the river scene to be replaced by the rather limited river traffic of the present day. The Isle of Dogs is a remarkable place, however it is probably not the place to scan the skies due to the amount of artificial light. 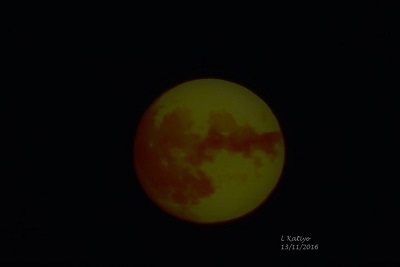 On Sunday and Monday, many Islanders were looking into the skies for the appearance of the Supermoon which in this particular case is when the moon appears 14% larger and 30% brighter than normal. This was considered quite a special Supermoon due the fact that the moon will come closer to Earth than at any other time since 1948 being only 221,524 miles (356,509km) away. 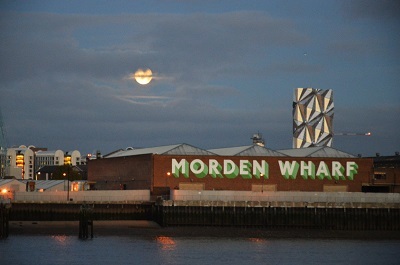 It was considered that Monday evening would be the best chance to see the Supermoon in the UK, unfortunately the cloud cover over London disappointed many skygazers. 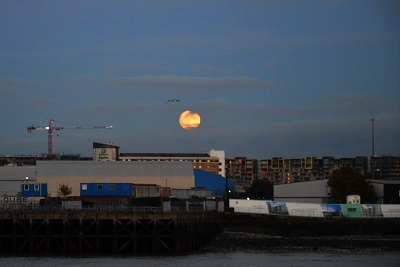 One skygazer who took a few photographs on Sunday was Isle of Dogs Life’s regular contributor L. Katiyo who trained her camera over Morden Wharf to capture the rare astronomical event. If like me, you missed the event, do not despair because the moon will get even closer on 25th November 2034 when the moon will be within 221,485 miles. 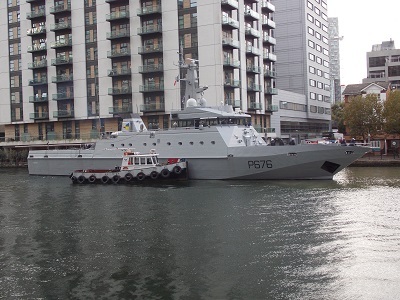 After a relatively quiet period in West India Dock, we welcome the arrival of French Navy ship Flamant (P676). 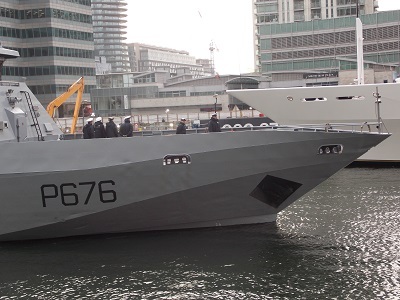 Flamant is a Flamant class patrol boats of the French Navy used for fishery monitoring, search and rescue, and patrolling France’s coastal waters. 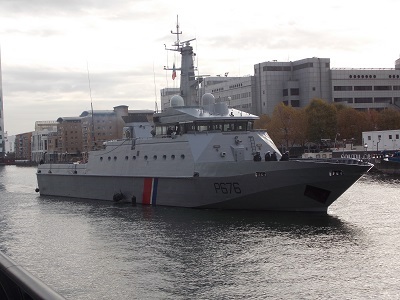 FS Flamant and sister ships FS Cormoran and FS Pluvier were built and are based in Cherbourg. The three boats were ordered 1993 and entered service in 1997. Cormoran and Pluvier have visited West India Dock previously in 2013 and 2014, Flamant is 54 m (177 ft 2 in) long and has a beam of 10 m (32 ft 10 in). 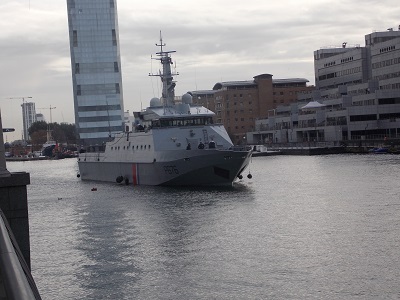 The ship usually carries a crew of 21 which includes 3 officers and 18 men. At this moment, we do not know the reason for the visit, however it could be related to Remembrance Sunday which takes place this weekend. Last week, I published a piece about Chris Hirst living on the Island in the 1980s. By the reaction to the article it seemed to bring back a few memories. In the second part, Chris is beginning to see signs of redevelopment especially with the building of the DLR. But there were far more important developments closer to home. Christmas 1984 was a cold one. 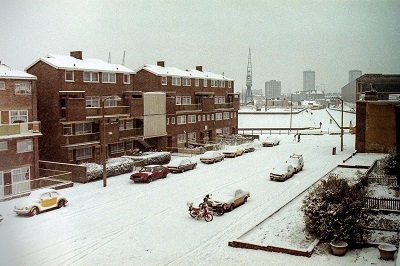 This picture above from Skeggs House shows snow on Glengall Grove, and you can also see that the Glass Bridge has now gone. 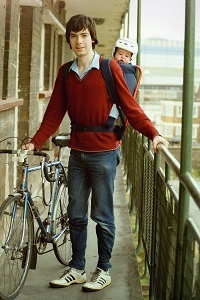 We still travelled everywhere by bike, despite the new addition that arrived in November 1984. 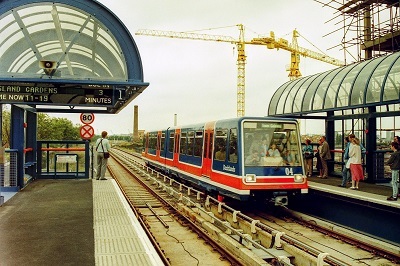 By the summer of 1985, construction of the DLR was well underway. 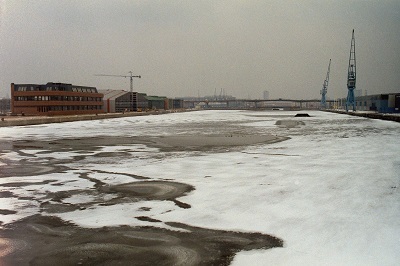 In early 1986 (February I think) it was cold enough to partly freeze Millwall Dock. There are more signs of redevelopment now, including the DLR although it was not yet open. The cold winter didn’t stop some from enjoying their water sports. 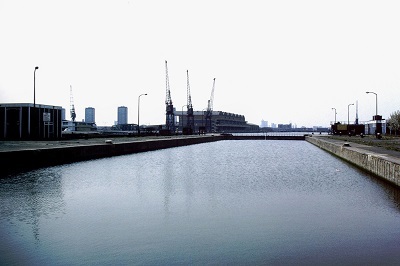 This next shot is from the bottom end of Millwall Inner Dock looking south west towards the Outer Dock. You can just see the remains of the McDougall’s silos near the centre of the picture, demolished but still recognizable on the ground. Skeggs House was renovated in early 1987, with new double-glazed windows, central heating, and new kitchens and bathrooms. This was a massive improvement. They did all the work on our flat in just a few days, and we didn’t have to move out. 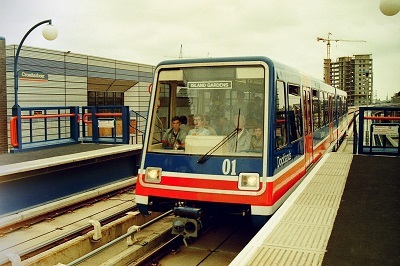 The DLR opened in August 1987. The following pictures were all taken on the opening day. The first one has Skeggs House in the background. 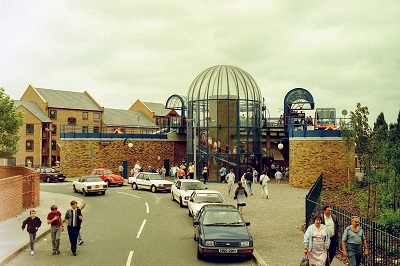 The final picture shows the original elevated platforms at Island Gardens. We moved away from the Island in 1988. Every couple of years when we visit London we almost always take a look around the old neighbourhood. Despite the huge changes with Canary Wharf and the other developments it’s nice to see at least some parts of the Island are still recognizable, including the Mudchute and most of the old estates (at least for now). 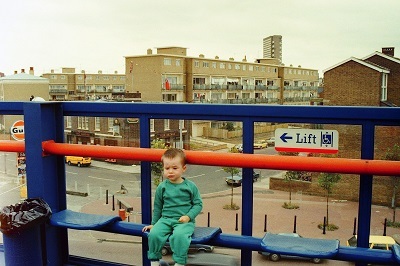 Many thanks to Chris for his memories and the amazing photographs, the DLR transformed travel around the Island and it is really interesting to see the original elevated platforms at Island Gardens which used the old London and Blackwall Railway viaduct. Recently, I was chatting with photographer Mike Seaborne who is well known for the photographs he took of the Island in the 1980s. We both said there was for various reasons, very few photographs of the Island in this important period survived when the docks had closed and redevelopment had not really began. This is why, I was delighted when Chris Hirst got in touch with some memories of his time on the Island in the 1980s and produced a number of fascinating photographs. Both give plenty of insights into a place which was lamenting the loss of the docks and was looking forward to an uncertain future. Chris takes up the story which I will publish in two parts. My wife and I moved to the Island in the summer of 1981. 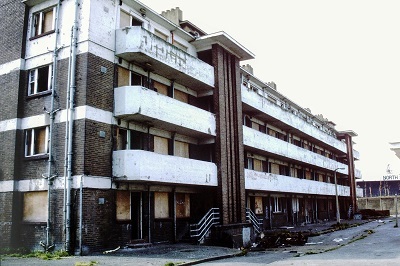 Tower Hamlets were offering “hard to let” council housing to students, and friends of ours had a 3-bedroom flat in Skeggs House on Glengall Grove and wanted someone to share it. Cheap rent was the only thing Skeggs House had going for it! The first picture shows the front of Skeggs House in 1981. Note there were no trees on Glengall Grove at that time. The old red telephone boxes are still there but would soon be replaced. The two people are on the balcony of our flat (number 7). Conditions in the flat were fairly primitive. The only heat source was a gas fire in the living room. The bedrooms were extremely cold in the winter (single-digit temperatures during a cold spell). The leaky windows let in all the street noise. The water heater was unreliable and exploded twice (once taking weeks to be repaired). The lifts never worked of course, but it was only two flights of stairs. The following picture was taken from the other side of Skeggs House. It all looks very much the same today! Public transport on the Island was pretty much limited to the 277 bus, but we bicycled almost everywhere and only used the bus occasionally. 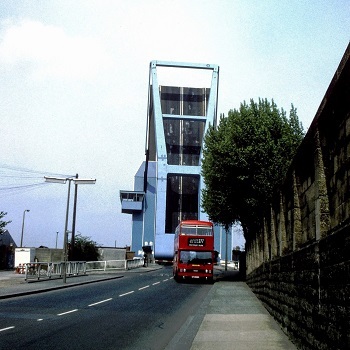 At the time the 277 route ended at the south side of the Blue Bridge and the bus turned around on that little loop of Manchester Road. 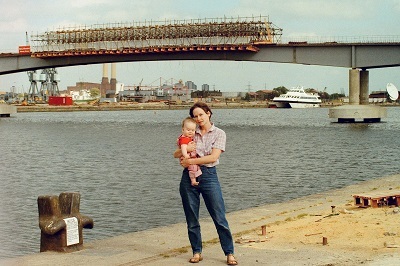 So it didn’t affect the bus if the bridge was up, as it was in this 1982 picture. 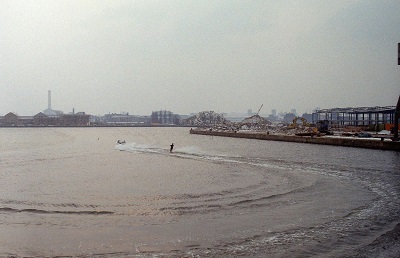 The next three pictures were all taken from or close to the Blue Bridge in 1982. The view towards South Dock was pretty barren, and nothing like it is today. I assume the three cranes near the middle of the picture are the same ones that now sit on the opposite side of the dock entrance. 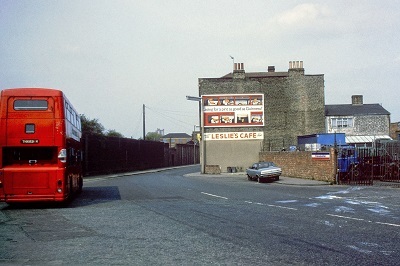 Leslie’s Cafe was demolished when Preston’s Road was straightened. We never went inside, but cycled past that spot daily. 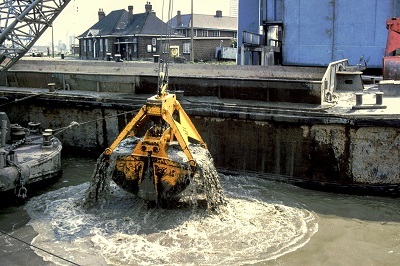 The dock entrance had to be dredged periodically, and that required the bridge to be raised. The next shot was probably taken on the same day as the one above showing the bridge open. 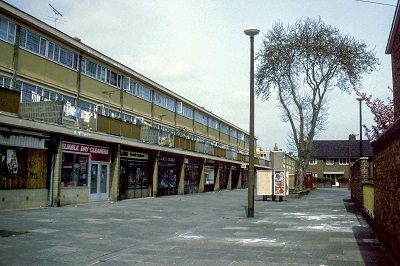 This was before the Asda was built so we did a lot of our shopping off the Island, although Castalia Square was useful for many things (including the launderette). 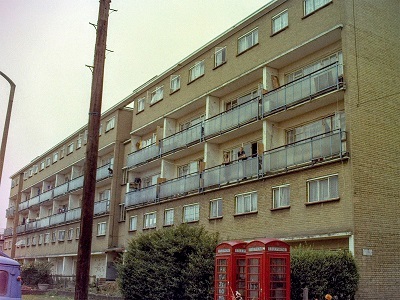 In the following 1982 picture note the old red telephone boxes, which are gone in Mike Seaborne’s 1984 pictures. The Glass Bridge was still standing when we first moved there, although I think it was already closed and soon afterwards it was demolished. This picture was taken from the balcony of 7 Skeggs House in 1982. 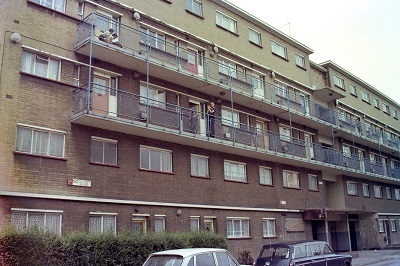 Roffey and Cubitt Houses were also still there, although no longer occupied by 1982. 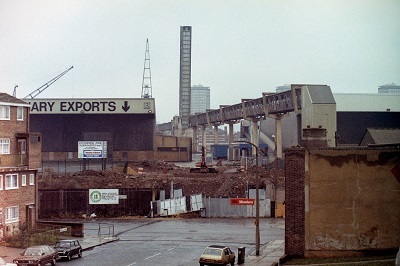 Things started to improve on the Island with the Asda opening in 1983, the Enterprise Zone and the red brick road with the new D1 bus, and the announcement of the DLR in 1984. 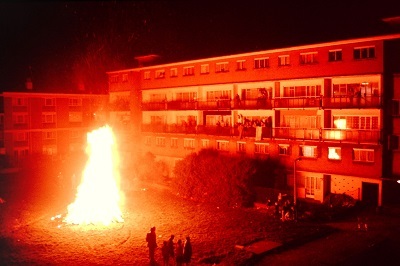 On November 5th 1984 there was a spectacular bonfire between Skeggs and Thorne Houses. This picture was taken from the balcony at the rear of Skeggs House. Many thanks to Chris for his contribution and the use of his photographs. 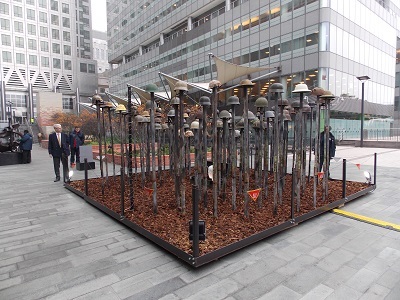 The Remembrance Art Trail at Canary Wharf consists of seven art installations created by international award-winning artist Mark Humphrey, the trail was created in association with the Royal British Legion and constructed with the help of the Corps of Royal Engineers. It consists of seven art installations, each piece has a different focus within the wider theme of military experience, aiming to encourage personal reflection and contemplation. London based artist Mark Humphrey is well known for public art and has created several large scale artworks for the Armed Forces and military charities. All of the pieces are being created here in the UK, using material salvaged from military sources and using some military manufacturing techniques. 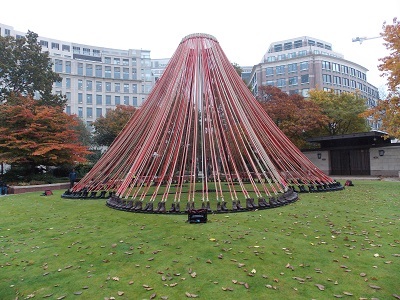 Lost Armies in Jubilee Park – a work about remembering the fallen and their sacrifices made, for all countries that fought for the British Armed Forces dedicated to The Not Forgotten Association. 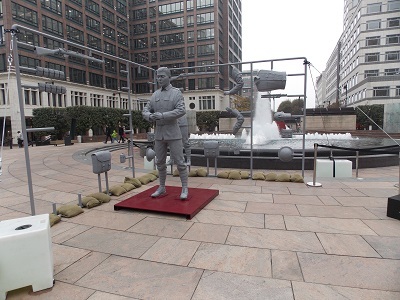 Boots on the Ground in Westferry Circus – a work about the spirit and soul of the British Armed Forces dedicated to Britain’s Bravest Manufacturing Company. 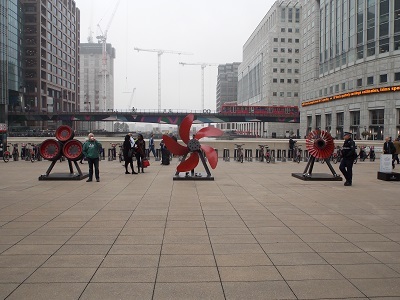 ANA (Army, Navy & Airforce) Triptych in Jubilee Plaza – a work about abstract poppy forms explored within military transport parts of the British Armed Forces dedicated to Royal Navy and Royal Marines Charity, RAF Benevolent Fund & ABF The Soldiers’ Charity. Fallen Soldier in Reuters Plaza – a work about remembering our servicemen and women during all conflicts dedicated The Royal British Legion. 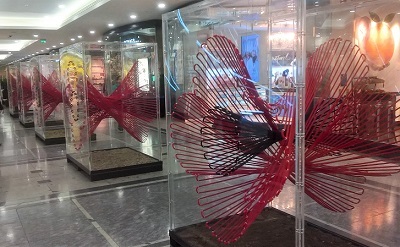 Point of Everyman’s Land in Jubilee Place Lower Mall level -2 – a work about war in time and space, moments of battle, peace and the point of Remembrance dedicated to The Poppy Factory. 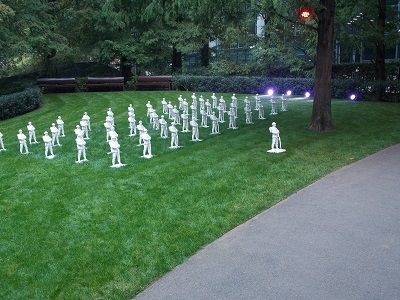 Lost Soldiers in Adams Plaza – a work about healing, remembering and forgiveness dedicated to Stoll. Brothers in Arms in Cabot Place – a work about human sacrifice, comradeship and remembrance for all military conflicts dedicated to Combat Stress. The trail is free to visit, open daily and there will be a series of free guided tours, if you want to walk around the trail yourself, you can download our Remembrance Art Trail map here. In the period up to Remembrance Sunday, the artworks are a reminder of the human cost of war and how a number of forces related charities provide ongoing support to former forces personnel and their families. The charities features are The Royal British Legion, RAF Benevolent Fund, Royal Navy and Royal Marines Charity, ABF The Soldiers Charity, The Not Forgotten Association, Britain’s Bravest Manufacturing Company, The Poppy Factory, Stoll and Combat Stress. 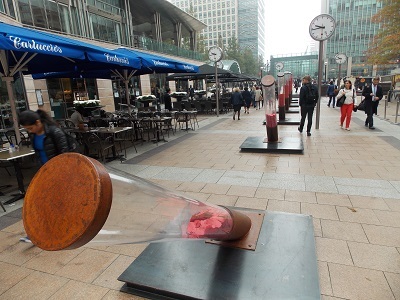 On Armistice Day, Canary Wharf will hold a Two Minute Silence at 11am at the art installations and the following locations where buglers will be playing the Last Post and Reveille to mark the occasion: Westferry Circus, Cabot Square, Jubilee Park, Canada Square Park, Jubilee Place Mall, Canada Place Mall and Reuters Plaza.